Canadian beauty Morgan Macgregor is a book critic by profession, but she gathers more fame from her married life. She is happily married to a TV actor and both are supportive of each other, reciprocating strength and motivation between themselves every day. 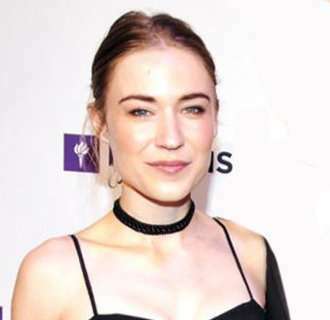 She is married to a well-known American actor Michael C. Hall and hit the new height of fame after involving in a romantic relationship with a renowned American actor, also known as Dexter Morgan in the TV series, Dexter. Morgan has found her man of dreams, but she weaves another entrepreneurial dream of opening a bookstore called Dead or Alive. Here are some quick wiki facts regarding her age, tattoos and her wedding with Michael C Hall. The former Associate Editor of the Los Angeles Review of Books is also an author at Book Riot, who frequently reviews fiction and now, working on her piece, her first novel. Morgan, who belongs to white ethnicity, wonders much in the bookish world and has her set of favorites. Her favorite book is Donna Tartt’s The Secret History, while the favorite movie is Tim Burton’s Beetlejuice. She is also an avid tattoo lover and has displayed an impressive array of her tattoos on the 2012's Emmy Red Carpet, which attended with her boyfriend, Michael. Perhaps trying to impress Morgan, her beau also inked himself with an interesting leaf shaped starburst tattoo on his right foot. As for height, Morgan stands at the closer height of her husband Michael, who is 1.77 meters tall. Writer Morgan Macgregor, whose age is still a mystery, got married to her longtime boyfriend Michael, 47, in a private ceremony in New York City on 29 February 2016. The two exchanged wedding vows at City Hall, keeping media far away from their memorable moment. The duo first appeared publicly as a couple on the red carpet at 2012's Emmy Awards at Nokia Theatre in LA. They’re totally together and cute. The relationship took its pace and both of them started dating and got married to each other. Michael's wedding with Morgan was his third marriage as he was previously married to star Amy Spanger and his Dexter’s co-star Jennifer Carpenter. According to wiki sources, Michael and Amy were in a married relationship from 2002 to 2007. A year, after the end of his first marriage, he remarried Jennifer in 2008. He is and always will be one of my best friends in the world...And just because the marriage ended doesn’t mean the love isn’t still there. As for Morgan, she has been showering love and support for her husband in numerous occasions. Back in 2016, Morgan was seen supporting her husband at the press night performance for his new play Lazarus, which was held at the King’s Cross Theatre on November 8 in London, England. Morgan and Michael have been seen in the public many times after their wedding. Morgan was also spotted with her spouse at the premiere of his latest film Game Night held at TCL Chinese Theatre, recently in February 2018. She has been showering love and support for her husband in numerous occasions. Back in 2016, Morgan was seen supporting her husband at the press night performance for his new play Lazarus, which was held at the King’s Cross Theatre on November 8 in London, England. Michael C Hall is now not involved in any shows on TV, but with the loving support of his wife, it is most likely that he will be seen on the screens soon. He is now considering about the reboot of his hit TV show Dexter if a good offer comes along. Surely, the couple’s love and support for each other is an affectionate scene for many, and may their married relationship will last for ages with both prospering in their endeavors. Joey Greco, The 'Cheater' Host An Outright Gay Or Secretly Married Man?